W. Lawrence points to another source: a fascinating letter discovered in the Hungarian Public Records Office written in 1547 from Vienna, a letter which is not mentioned in any other reference on the source of Measure for Measure, including Bullough’s Narrative and Dramatic Sources of Shakespeare. The letter tells of an incident which took place in Milan in the same year. It appears that a wife (= Isabella? ), in order to save her condemned husband (= Claudio? ), pleaded with the city’s chief justice (= Angelo?) who promised to pardon her husband at the price of her honor. The wife yielded, but her husband was beheaded nonetheless. The wronged woman traveled to Milan to complain to the Emperor, Don Ferdinando Gonzaga (= Duke?). The wicked city justice was forced to marry the widow and was beheaded the next day, similar to the Duke’s original issue regarding Angelo’s fate to marry Mariana and then be summarily executed (Lawrence, 86-87). 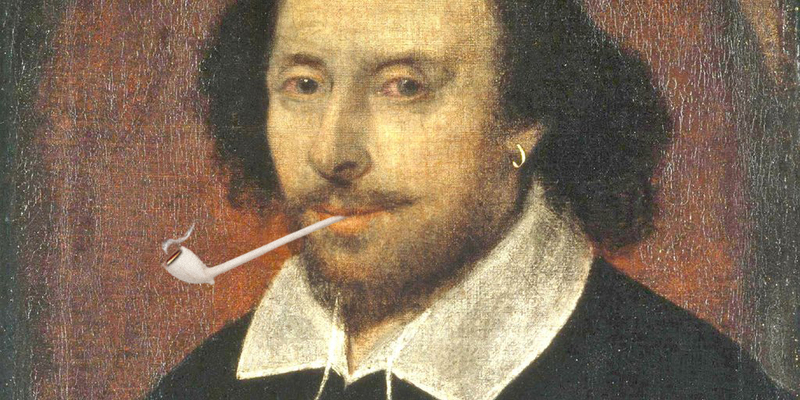 Most certainly, Shakespeare was unaware of the letter’s existence, but the story itself could have made its way into English consciousness, especially in more literate circles. Almost the exact same story was retold in 1607 by Goulart in his Histories Admirables et Memorables advenues de Nostre Temps. In his version, the historical figure of Don Ferdinando Gonzaga becomes the Duke of Ferrara. Both versions deal with the subject of justice and mercy. 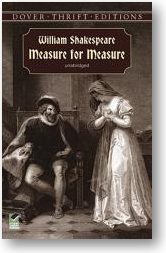 Although Goulart published Histories in 1607, after production of Measure for Measure, no doubt the essential story was well-known in England many years prior to publication. Other variations in the original source include differences between Cinthio’s Hecatammithi and his Epitia. For instance, in Hecatammithi, which was originally published in the Italian in 1565 and later translated into French in 1584 (no English version existed until a century after Shakespeare’s death, but Shakespeare may have read the French version), the condemned man is beheaded, while in Epitia, the condemned man is spared by the substitution of another criminal (as is Claudio spared). The fanatical advocacy of Law in Angelo can be traced to the equally unswerving Podestá in Epetia. One of the most interesting changes from the original narratives includes the setting of the play. Whetstone casts much of the action in the seedy side of town, a world of whores (bawds), whore houses, shyster lawyers, and pick-pockets. Indeed, Whetstone’s characterization of the “perilous mischiefs bred in the bowels of the City of London” came from personal experience, as he spent time in that section of the city. Accounts of his first-hand inner-city exploits appear in his first book, The Rocke of Regard (1576). One of Whetstone’s close friends was George Gascoigne, who wrote The Glasse of Government (1577), a play including the characters of a whore, a bawd, a pimp, and a parasite. Some criticism suggests that he and Whetstone may have explored London’s seedy-side together, imbibing in taverns, and that it is from that relationship and literary influence that he borrowed his setting for Promos and Cassandra. Their friendship was so close that Whetstone wrote Gascoigne’s obituary when he died. Strikingly similar in Glasse is how magistrate Severus (Severe; the opposite of Angelo: Angel. In Hecatommithi, Angelo is aptly named Juriste [law-giver], while in Epitia the Duke becomes Juriste) administers justice without mercy or compassion. Shakespeare’s The Taming of the Shrew uses as a basis for the subplot, Gascoigne’s Supposes. Quite probably, some critics suggest, since Shakespeare knew Gascoigne, he may have also known Whetstone. Bullough makes no mention of Gascoigne or the 1547 Letter, thereby failing to fully trace Measure’s origin and its geographic locale, particularly its setting in the seedy-side of Vienna. Shakespeare may have explored the underbelly of London. The Globe and other theatres (Bear-Bating, et al) resided along the then-little-populated bank across the Thames from London’s metropolitan residential and business districts. Shakespeare may have spent many evenings frequenting taverns and inns as distraction from writing, perhaps even editing his plays-in-progress over ale, absorbing that side of the city’s base culture. This first-hand experience would account for the authentic dialogue of the bawds and other sordid characters in the play whose language is “dead on.” Shakespeare maintained Whetstone’s intriguing locale in Measure for Measure. Scholars question the reasons for this degenerate setting, even arguing that the play “exists almost totally in what feels like a sewer” (French, 182). But one of the definitions of the Problem Play is that they are ripe with rottenness (and sexuality). It may also be that the juxtaposition of a world of sexual looseness (debauchery) and weak morality in contrast to the play’s themes of justice, mercy, false authority (Cox, 1), and sexual regulation, sharpens the ethical poignancy. Indeed, in The Problem Plays of Shakespeare, Ernest Schanzer points out the dichotomy that “out of the seething wickedness of Vienna there rises the dazzling, white, and saintly figure of Isabella” (71-72), a contrast and irony that elevates the play. In most productions of Measure, Isabella is portrayed as wearing white, a symbol of innocence and purity (chastity). One of the most important plot contributions Shakespeare makes to the story is the “bed-trick” in which Marianna is surreptitiously substituted for Isabella, offering a satisfactory resolution wherein Isabella preserves her chastity and circumvents punishment for adultery. In all of the previous and diverse manifestations of the story, including the 1547 Hungarian Letter, the Isabella character actually surrenders her chastity. Indeed, in St. Augustine’s version the rich man’s wife is punished for her adulterous behavior. The “bed-trick” allows Isabella to escape judgment and punishment and therefore maintain some comic elements. While Lever (xlviii) and Powers (35) weakly argue that Duke Vincentio is a thinly veiled King James, a more likely argument is that Deputy Angelo was modeled after William Fleetwood, Recorder of the City of London (akin to a chief prosecutor), who was famous for his rigorous enforcement of laws regarding the moral behavior of London citizens. Several books of the time were dedicated to Fleetwood, including John Ewick’s Of the duetie of a magistrate in the time of the plague (1583) and Whetstone’s A Mirour for Magestrates of Cyties (1584). Indeed, six years prior, Whetstone dedicated Promos and Cassandra “to his worshipfull friende, and Kinseman, William Fleetwood, Esquire, Recorder of London” (Bullough, 442). According to Prouty, “justice was a rare commodity in the Renaissance” (138) and Whetstone’s interest in the notion of just government by incorruptible magistrates eventually led to writing Promos and Cassandra. The original setting of the play, then, would be Austria (if we use as basis the 1547 letter in the Hungarian Records Office which is said to have originated in Vienna). More specifically, the city of Innsbruck as mentioned in Epitia—or the city of Julio as mentioned in The Heptameron— a perversion of the town name “Iula” located in the eastern province of Hungary near Transylvania, a city vividly connected with Justice (Prouty, 139). Therefore, the translocation of the play’s setting from Julio in Hungary to Vienna is not as far-fetched as it might appear, and that the addition of low-morality characters from the seedy-side of inner cities and the continued interest in justice and mercy, as borrowed from Whetstone and Gascoigne, is also parcel to the purpose of Measure for Measure, a play in which Shakespeare was trying to provide his audiences with a new play on an old theme. Alan Powers and others argue that Shakespeare was influenced in writing Measure for Measure by contemporary issues in Law Reform, citing that the “standard of Jacobean justice was theatrical in conception and arbitrary in practice” (35) and citing numerous laws issued by the newly-crowned King James. That year saw the inception of conflict between king and parliament which was to lead to the English Civil War. The conflict came to focus on the question of who had the authority to say definitively what the law was. The king argued for his prerogative, the parliament for its ability to define the common law. Thus, says Louise Halper, Measure can be successfully read as Shakespeare’s brief in favor of the king (1). Legal issues of the day had little influence in the actual formation of the play since half-a-century-old variants of the story clearly steer the action, setting, and undercurrents of the play. However, Shakespeare’s decision to select this familiar story as basis for Measure for Measure may well have been influenced by contemporary English laws and their enforcement, as writers often select their subjects based on issues that would interest a contemporary audience. This aspect alone may account for why Shakespeare chose to write Measure, a play with a convoluted history of literary-borrowing that sharply, if not problematically, counter poses one of the central socio-religious issues of his day. Perhaps the earliest transient reference to a possible origin of Measure sheds the most light on the irresolvable nature of the “Problem Play.” In De Consolatione ad Marciam (40 A.D.) Seneca writes, “Our world is but a speck; and our life, when counted in this panorama, is still less than that; for the measure of eternity is still more than the measure of our world when we remember that the world must renew itself over and again within the bounds of time” (Harper’s, 2; emphasis mine). Perhaps the very reason why Measure (and plays such as it) raises difficult questions and offer its interpreters no easy answers is because, as Seneca suggested almost 2,000 years ago, there can be no easy answers because of man’s (and woman’s) eternally failing nature. Some socio-cultural conflicts are irresolvable, “renewing themselves [sic] over and over again within the bounds of time.” Suffice it to say, in the ironically named Angelo (Angel), Shakespeare crafted a character as merciless, cunning, selfish, and without conscience as Iago from Othello, widely considered one of the worst villains in literary history. Perhaps it was from his many sojourns into the dark and seedy underside of London that he witnessed such deeds of wickedness. Perhaps he was simply burning the herb. Contributing Editor John Smelcer is the author of over 40 books, including “Beautiful Words: The Complete Ahtna Poems” (foreword by Noam Chomsky). You can read more about him in About Us. Bibliography Bullough, Geoffrey. Narrative and Dramatic Sources of Shakespeare [all references from Vol. II]. New York: Columbia UP, 1958. Cox, John. “The Medieval Background of Measure for Measure”. Modern Philology, Vol. 81, No. 1 (August) 1983. Accessed 09/22/2008: www.jstor.org/sici?sici=0026-8232 (198308)81 French, Marilyn. Shakespeare’s Division of Experience. New York: Ballantine, 1981. Halper, Louise. “Measure for Measure: Law, Prerogative, Subversion.” Cardozo Studies in Law & Literature, Vol. 13, 2001. Accessed 10/13/2008 http://papers.ssrn.com/so13/papers.cfm?abstract_id=283962 Harrison, G. B. (Ed.). Shakespeare, The Complete Works. New York: Harcourt Brace, 1968. Holzknecht, Karl, J. The Backgrounds of Shakespeare’s Plays. New York: American Book Company, 1950. Lawrence, W. W. Shakespeare’s Problem Comedies. New York, 1931. Lever, J. W. (Ed.). Measure for Measure. London: Methuen, 1966. Mandelkern, Jillian. “Measure for Measure: An Introduction.” Accessed 10/18/2008: www.associatedcontent.com/article/227876/measure_for_measure Powers, Alan. “Measure for Measure and Law Reform in 1604” in The Upstart Crow, vol. xv, 35-47, 1995. Prouty, Charles. “George Whetstone and the Sources of Measure for Measure” in Shakespeare 400: Essays by American Scholars on the Anniversary of the Poet’s Birth, James W. McManaway (Ed.). New York: Holt, Rinehart & Winston, 1964. Schanzer, Ernest. The Problem Plays of Shakespeare. London: Routledge & Kegan Paul, 1965. “Seneca’s Measure of the Human Life, from De Consolatione ad Miarciam.” Harper’s. Accessed 10/20/2008: http://harpers.org/archive/2008/03/hbc-90002564 John Smelcer, long-time contributing editor at Ragazine, is the author of over fifty books, including two novels based on Shakespeare plays.